All 5 pieces bolt on to existing mounting points with no welding or fabricating required. 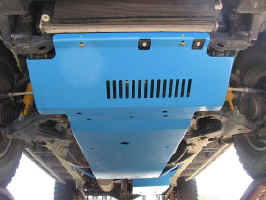 Low hanging exhaust crossover pipe is protected with a smooth sheet of steel or aluminum. NOTE: If you order this set in aluminum, the crossmember will be powder coated black and made of steel. If you have a diff drop, you will need to get spacers from the maker of your diff drop to space your skid plates. Strength without the weight. Our 5052 laser cut aluminum alloy has the same strength levels as our 3/16" steel, but at a faction of the weight. We recommend aluminum where the application sees regular off-roading, yet limited potential for dragging on hard surfaces like rocks. While 1/4" aluminum has the strength to handle heavy rock impacts, it is much more susceptible to galling than steel, when dragged over rocks. Galling results in what looks like fine aluminum shavings by the rock that was dragged down the plate. Another way of thinking about this is by first stating that aluminum has no problem at impacting an obstacle, it's what happens after impact that matters. After impact, if your driving style is to reassess the trail and choose a better line, aluminum is the right choice. If your driving style is to continue on the same line, as in rock crawling applications, we would recommend our 3/16" steel systems. Aluminum does not require prepping and repainting impact areas to prevent rust.